Here I will explain how to solve the problem “the files use a different language which is not allowed since they need to be compiled together” when running web application using asp.net. 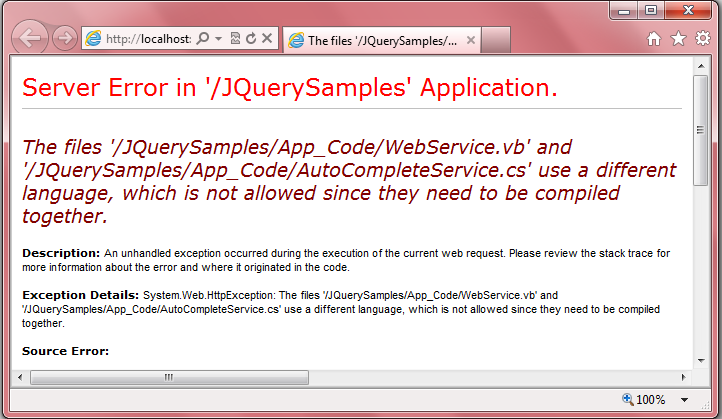 I got this error because of using different language (C#, VB.NET) webservice class files in same App_Code folder. To solve this problem we need to create separate folders for C# code and VB.NET Code files in App_Code folder and place the C# code files in one folder and VB.NET code files in another folder and need to add some code in web.config file. If you observe above code I added codeSubDirectories relating to App_Code folder and directoryName will represent a sub folder of App_Code folder. Once we set these configurations in web.config each sub folder will compile separately and respective class files will save in CSCode and VBCode files. After add code run your application it will work for you. Thank you so much sir.. its working..